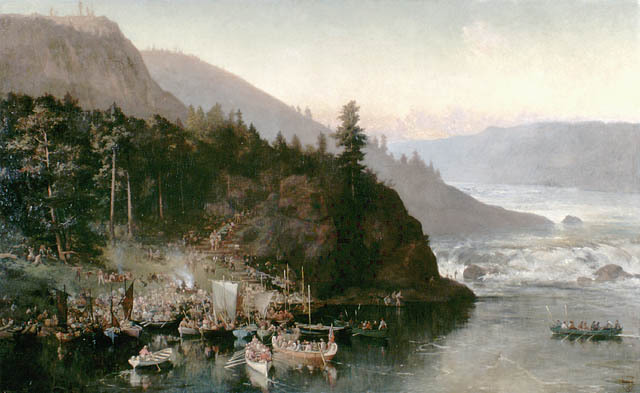 In 1870, British Colonel Garnet Wolseley (1833–1913) landed with his men at Kakabeka Falls (Ontario), a major canoe portage along the voyageur network of rivers and lakes to Fort Garry (now Winnipeg, Manitoba). Charged with putting down the Métis rebellion (Métis resistance) at the Red River Colony, over 1,000 men created corduroy roads to transport provisions, equipment, and even cannons over portages like Kakabeka. Wolseley’s able command, throughout one of the most daunting and difficult treks in military history, was recognized as an impressive feat of tactical leadership in early Canada. A large-scale and richly detailed painting documenting the achievement, by an artist known for her astonishing technical realism, is one of the showpieces of Library and Archives Canada’s (LAC) collection. Commissioned by Wolseley himself in 1877, the painting represents the only occasion on which British painter Frances Anne Hopkins (1838–1919) represented an actual historical event. Uhlyarik is the Canadian co-curator of an ambitious new show which opens at the AGO today. 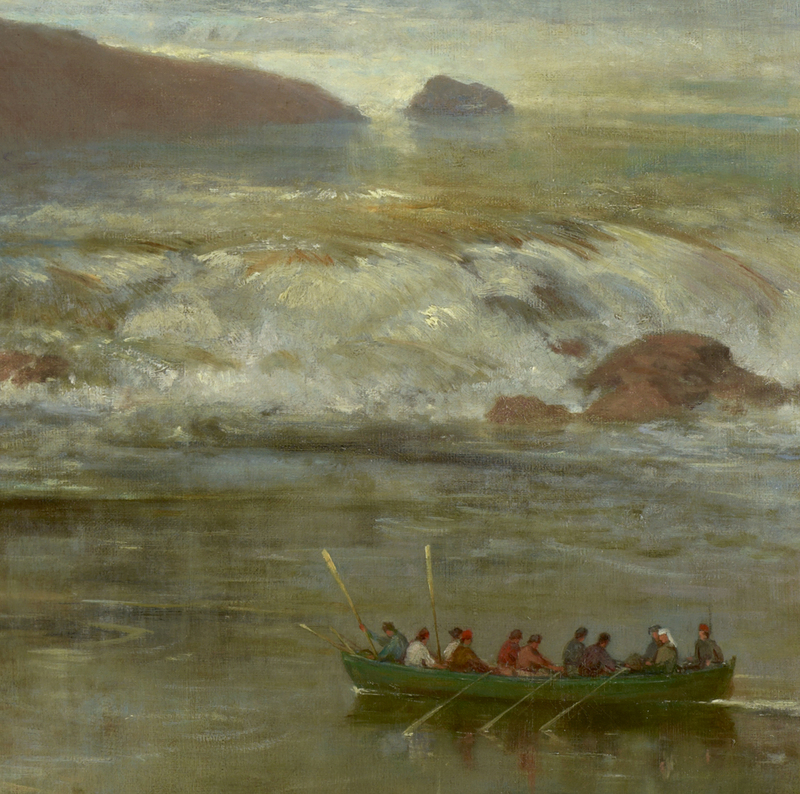 The first exhibition to exclusively examine 19th- and early 20th-century Pan-American landscape painting, Picturing the Americas considers ways in which paintings featuring North American scenery, such as this one by Hopkins, may have worked as symbols for the development of national identities. The subject of Hopkins’s painting is, after all, a military action undertaken largely to counter potential American expansionism. It’s long been recognized that Hopkins deliberately changed details of the Kakabeka landscape, in order to make her composition stronger. She probably never intended to include the entirety of the rather overwhelming waterfall, as this would have detracted from a focus on Wolseley’s men. The river rapids are a product of Hopkins’s imagination, together with background hills that are almost extended into mountains. Would 19th-century viewers have read the mastery of one section of difficult territory as a stand in for the larger-scale mastery of the Canadian west? If so, Hopkins’s manipulation of the true landscape of the area may have served, in part, to reinforce this message. Picturing the Americas remains at the AGO until September 7, 2015. It will then travel to the Crystal Bridges Museum of American Art in Bentonville, Arkansas (USA), and the Pinacoteca do Estado de São Paulo (Brazil)—opening just in time for the start of the 2016 Summer Olympic Games, in Rio de Janeiro. This entry was posted in Art and tagged Exhibitions, Frances Anne Hopkins, landscape by Library and Archives Canada Blog. Bookmark the permalink.